Updated Monday December 3, 2018 by LMLL. Get in the holiday spirit and help out the Mamaroneck High School softball program while you're at it! 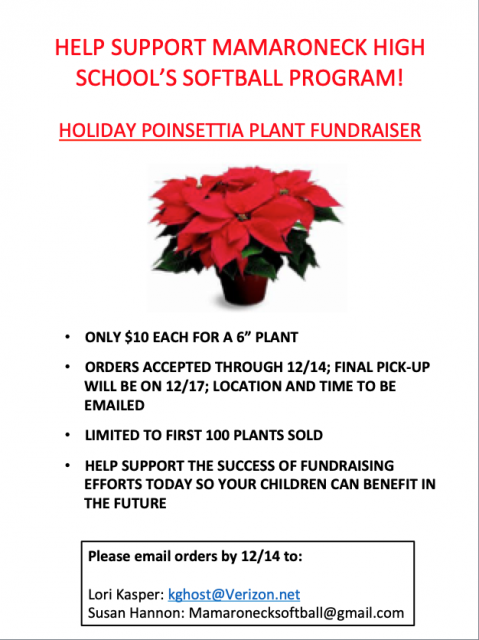 MHS Softball is selling poinsettia plants as a fundraiser. Six-inch plants are available for $10, though quantities are limited. Orders will be accepted while supplies last or until Dec. 14th. To place your order or to find out more information, please email Lori Kasper (Kghost@verizon.net) or Susan Hannon (MamaroneckSoftball@gmail.com).